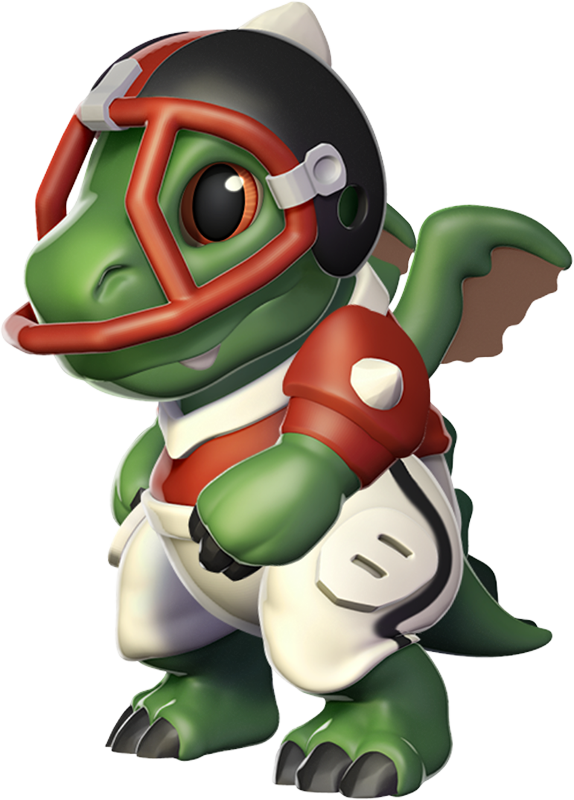 A natural leader, the Touchdown Dragon once tried roaring instructions to its teammates during battle. It soon learned dragons only follow orders when and IF they feel like it. 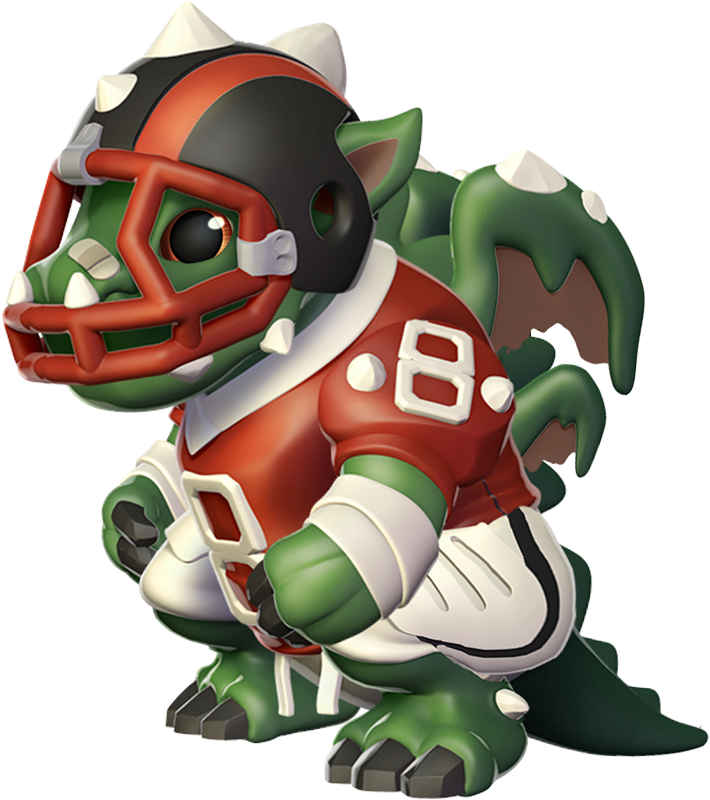 The body style of the Touchdown Dragon is ursine. It has a dark green body and orange eyes while the skin in its ears and in-between its wing bones are a dark pink. 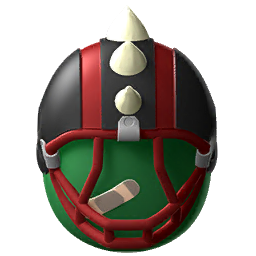 It has the appearance of an American football Trainer, wearing a black and red-striped football helmet, a red and white-lined uniform with the number '8' on it, along with a pair of red shoulder pads both with the number '8' on them. Two short white spikes jut out on either side of the '8' on the shoulder pad, and chest padding can be seen underneath this Dragon's uniform. It wears white pants with black lines running down the sides of them while strips of white cloth are wrapped around this Dragon's wrists. 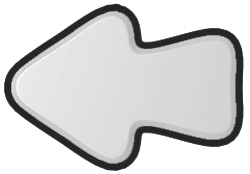 A small plaster is apparent on this Dragon's snout (a reference to the fact that American football is a rough sport and can cause injuries) and a pointy ear sticks out from underneath the helmet. Three short white spikes run up the middle of the helmet; similar spikes can be seen jutting out of the side of its lower jaw, the apex of its wings, and its feet. Its claws, unlike other Dragons', are black and chunky, and a large spike-lined tail can be seen trailing behind it. The Touchdown Dragon is an Event-Only Dragon which can be obtained most frequently through one or more of the various events within the realm of Dragolandia. Once this Dragon is obtained and then subsequently housed on an island, duplicate eggs can be purchased through the Dragon Codex in exchange for 1,840 Gems. 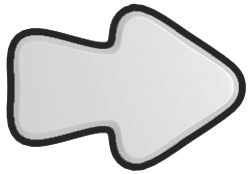 This page was last edited on 26 January 2019, at 08:43.